ENSENADA, Baja California, Mexico—Conspicuous by his absence on earlier entry lists, SCORE has confirmed that legendary Off-Road Motorsports Hall of Famer and AMA motorcycle Hall of Famer Larry Roeseler is teaming up with third-generation desert racer Dan McMillin to form a formidable force for next week’s Golden Anniversary of the legendary BFGoodrich Tires SCORE Baja 500. Pre-running on the rugged, race-record 542.12-mile course continues through Friday (June 1). Over 350 vehicles, in classes for cars, trucks, utvs, motorcycles and quads, are expected at the start line with racers from as many as 35 U.S. States and 20 countries anticipated. Race title sponsor BFGoodrich Tires has posted a US$25,000 contingency bonus to help commemorate this year’s race. King Shocks has posted an US$5,000 contingency bonus, Rancho Drivetrain Engineering is offering a $20,000 transmission as a contingency bonus and Tri-Ace Tires is also offering a US$25,000 contingency bonus. A member of both the Off-Road Motorsports Hall of Fame and the American Motorcycle Association (AMA) Hall of Fame, SoCal’s Larry Roeseler has earned international fame racing on a motorcycle, an open-wheel desert race car and in a SCORE Trophy Truck. The SCORE Baja 500 has helped earn Roeseler, 61, his many honors with his exploits that include 17 class wins and a race-high 11 overall wins in this race, including nine on a motorcycle. 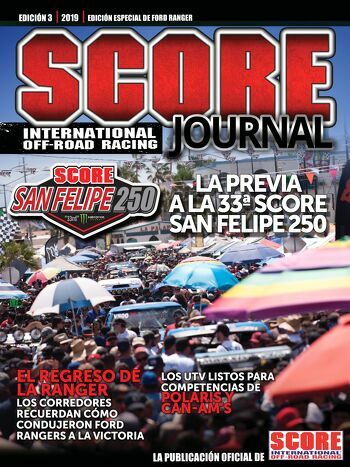 Last year in the SCORE Baja 500 Roeseler drove solo to win the new SCORE TT Legend class for drivers over 50 years old. This year, LR as he is known in racing circles, will share driving duties with San Diego’s Dan McMillin behind the wheel of the No. 23 Mark Racing Ford F-150 built by Racer Engineering. Roeseler’s 17 class wins in the SCORE Baja 500 are spread out over a remarkable 45-year period. While Roeseler won his first motorcycle class win in 1972 in this race, he earned the first three of his 11 overall victories while teaming with three different co-riders in three consecutive years. In 1975 Roeseler teamed with the late racing great Bruce Ogilvie on a Harley-Davidson motorcycle. He won in 1976 with A.C. Bakken on a Husqvarna motorcycle and again in 1977 on another Husqvarna but this time with the legendary Jack Johnson. His two 4-wheel overall wins in the SCORE Baja 500 came in back-to-back years in 2002 and 2003 when he split the driving with Las Vegas’ Troy Herbst in the iconic ‘Land Shark’ unlimited Class 1 open-wheel car built by Mike Smith. Roeseler’s monumental career includes 10 gold medals in the International Six Days Enduro (ISDE) in Europe. He also has 17 career class wins in the SCORE Baja 1000 including a race-record 13 overall wins (10 on motorcycles and three in 4-wheel vehicles). In the SCORE Baja 1000, LR won the overall back-to-back in 2004 and 2005 with Troy Herbst in the record-setting ‘Land Shark’ in Class 1 and in 2008 he earned his third 4-wheel vehicle overall as the second driver for current SCORE owner Roger Norman in the marquee SCORE Trophy Truck division in a peninsula race from Ensenada to La Paz. Roeseler was inducted into the AMA Hall of Fame in 1999 and was honored in like manner in 2012 by the Off-Road Motorsports Hall of Fame. In addition to his three career SCORE Trophy Truck race wins, LR also won races earlier in his lengthy racing career of nearly 50 years in the AMA National Hare and Hound Series and the AMA National Enduro Series. The total of 304 entries to date have come from 32 U.S. States, U.S. Territories-Guam and Puerto Rico along with 14 total countries–host country Mexico, Andorra, Argentina, Austria, Canada, Finland, France, Germany, Italy, Japan, New Zealand, Peru and Spain. States among the field range so far from Alaska, Hawaii, California, Washington and Oregon in the Pacific West, Nevada, Idaho, Arizona, Utah, Montana, Wyoming, Colorado and New Mexico in the Mountain West, New York, New Jersey, Rhode Island and Connecticut in the Northeast, Illinois, Ohio, South Dakota, Kansas and Texas in the Midwest and Florida, Louisiana, North Carolina, Tennessee and Virginia in the South. The marquee SCORE Trophy Truck division for high-tech, 950-horsepower, unlimited custom trucks has 35 official entries. Other classes with double-figure entries besides SCORE Trophy Truck with 35 are Pro UTV FI (Forced Induction) with 37 entries, Trophy Truck Spec with 25, Class 10 with 22, SCORE Lites with 19, Sportsman Moto with 19 also, the unlimited Class 1 with 13 and with 10 each are Class 1/2-1600, Class 11 and Pro Moto 30.